One of the best investments you can make in your property is to keep your trees and shrubs safe, healthy and beautiful by maintaining a pruning program. Periodic pruning to remove plant parts is done for safety, appearance, structural integrity, and the health of trees and shrubs. It is also necessary after storm damage. 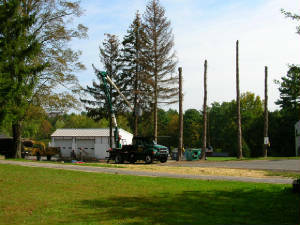 We can safely remove any number of trees to eliminate hazards or clear space for all of your needs. We dispose of trees in a careful and efficient manner, minimizing waste and impact to your landscape. We have a unique, slow release fertilizer that is injected sub-surface into the fibrous root zones of trees, shrubs and ground covers. Because the fertilizer is released slowly, it results in a more consistent feeding throughout the entire growing season. Fertilization improves the growth and health of your trees, shrubs and ground covers. It also increases resistance to diseases and insects. If one or more of your trees has been a storm victim, or if you have trees that look like they pose a potential safety hazard, give us a call. We can clean up the damage and make your property safe again. Stumps can be a maintenance obstacle and a blemish to an otherwise beautiful landscape. We can grind below surface, in order to eliminate stumps and improve maintenance, safety and the appearance of your landscape. Certain trees may lose their structural integrity, due to pests, disease or weather. Cabling and bracing helps support a weak tree, and can reduce the chances of complete removal. Whether you’re looking to add a beautiful tree to your landscape, or to install a row of evergreens for privacy, we can handle all of your selection and planting needs. All of our evergreens are locally grown at Seekonk Tree Farm, www.seekonktreefarm.com. 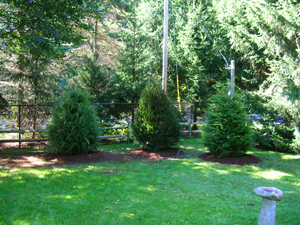 When it comes time to selecting the right evergreens, appointments can be made to view the trees prior to digging. Insects and disease can infest your trees, making them unsightly and weak, increasing their chance for failure. We can help keep your trees clear of pests, so that you don’t have to worry about anything imperiling your tree’s health. Brush can make areas unsightly and increase the potential for fire hazard. Brush can also make areas crowded, and take up space, making areas of your property less useful. Call us and we can clear any area of unwanted brush, making your property safer and more user-friendly. 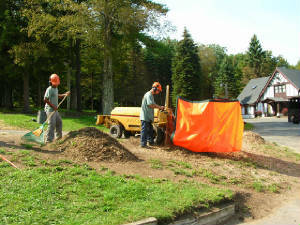 We can reclaim your fields and clean out your forested areas to improve their health and safety for your enjoyment. Many fields have become overgrown by brush and trees, and need to be reclaimed. Forested areas need to be thinned, and hazardous trees removed, so that the remaining trees can thrive. Many invasive species can be identified and removed before they become a threat to the rest of your property.